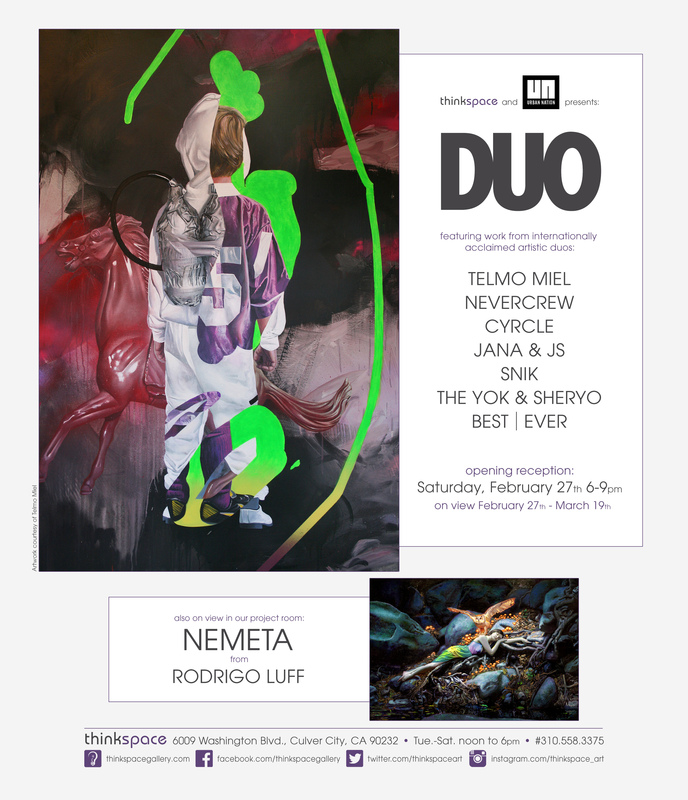 Thinkspace (Los Angeles) – in collaboration with Berlin’s Urban Nation, is pleased to present DUO, a group exhibition featuring works by internationally acclaimed contemporary art duos: Best/Ever, Cyrcle, Jana & JS, Nevercrew, Snik, Telmo Miel, and Yok & Sheryo. These monikers are recognized the world over as belonging to some of the very best Muralists in the contemporary art scene. Each namesake represents a pair working collaboratively to create inspired, site-specific works across a variety of styles and techniques. The artists will be represented in DUO by two to four new works each, and the exhibition will also feature a site- specific gallery installation and mural by Brooklyn’s Yok & Sheryo. A duo hailing from Dorset England, Best/Ever is Neil Edwards and Hadley Newman. Their mural style combines elements of photorealistic painting, anatomical drawing, and loose painterly improvisation. Known for its darker and more disturbing portrayals of the human form, their work pairs anatomy with decisive graphic lines and abstracted areas. They often combine figurative and representational elements to create surreal composites; bodies and bones overlap and faces seem to merge. With an emphasis on hands and face, their work strives to capture the emotive and expressive potential of the body in a variety of psychological states, dissecting it formally to an almost surgical extent. Using a stark palette of muted grays, ashen whites, and dark contrasts, their evocative works are ghostly and at times melancholic. Cyrcle is an LA-based duo made up of David Leavitt (Davey Detail) and David Torres (Rabi). Their collaboration is driven by an irreverent and inexhaustible injunction to tirelessly live and breathe art, in defiance of death and above all else. With an interest in the exploration of the human condition, its duality, and the entropy and chaos that inevitably inform creativity, their projects are varied and at times interactive. They strive to avoid reductive categorization, and work across a variety of media and creative platforms. They have created site-specific murals and street installations, like their huge 11,000 square foot mural “Magic is Real” in Echo Park, but they also take their work to the gallery space, creating installation, performance, and object based projects. Their aesthetic encompasses graphic design, art history, classics and futurism to blur the proscriptive lines of what art can be. A duo working out of Austria, Jana is from Salzburg, and JS is from France, near Paris. A couple, their work is stencil based, incredibly precise, and inspired primarily by their personal photographic work. Interested in combining the figurative with architecture, their outdoor pieces are primarily found in major European urban centers and tend to vary in scale. They work with a variety of media to create detailed stencils, using acrylic, ink, pencil, and spray paint on architecture, wood, glass, metal, canvas or paper. Creating these interventions in a variety of contexts, they have been known to use everything from trees in forests and railway tracks, to all manner of found materials. Often portraying people in pairs, their work is about intimacy and human connection, capturing a sense of vulnerability in the passing of time. Nevercrew is Christian Rebecchi and Pablo Togni, Swiss artists based in Ticino, Switzerland. Interested in the tension and back and forth of being a collaborative duo, tangential relationships are very much a part of their aesthetic and process. Interested in systems and the inner working of living things, they create pseudo “machines” or “living structures,” to explore the systemic and conceptual interactions among individual parts. The works combine fantastic pairings of realistic animals and fictional mechanical systems to create a surreal universe of weirdly bionic hybrids. 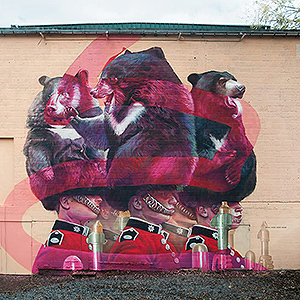 At the heart of these colorful, large scale murals is a concern for the increasingly tenuous relationship between man and nature. Mixing realistic painting styles with stencils and phenomenal graphics, their works, though seemingly playful, are thought provoking metaphors for social and political relationships. Britain’s Snik is couple Nick and Laura. Nick began working as Snik in 2005, later pairing up with Laura at the end of 2014. Working in stencil and spray paint, the duo is constantly pushing the boundaries of their medium. Snik will hand cut up to nine layers of stencil at a time, creating the depth and realism for which their work is known, with several overlays and applications of paint and varnish. The level of detail in their work is impressive, and the painterly approach of their technique is unique in its texture and dimensionality. By combining the precision of the graphic stencil cuts with the more chaotic and free application of paint, their works balance chaos with control. The same aesthetic applies to their work on canvas, where they offset the accidental aspects of studio work with drips, bleeds and smudges, with the precision of graphic stenciling. A muralist and image-making duo from the Netherlands, Telmo Miel is Telmo Pieper and Miel Krutzmann. They have worked together since meeting at the Willem de Kooning Academy in Rotterdam in 2007, officially becoming Telmo Miel in 2012. Their murals are both surreal and realistically rendered, with a tremendous amount of detail and vibrant color. Able to work fairly seamlessly, their styles have combined to such an extent that they’re able to execute multiple areas in tandem, exchanging places and completing each other’s work. They often execute their pieces on a monumental scale, creating huge architecturally sized spray-paint paintings on building façades. Combining multiple elements in a single composition, they layer references to the human and animal worlds to create complex creatures and fantastic scenarios. With positivity, humor and a touch of the romantic, their work is arresting and epic. Yok, Australian born, and Sheryo, from Singapore, are a muralist duo and couple based in Brooklyn, New York. They first started painting walls together in Cambodia, where they realized the aesthetic and personal affinity they shared. Known for their twisted, dynamic illustrative style, and their use of stark primary palettes, they often work in red, white and black tricolor. Their hallucinatory murals feature everything from cannibalistic pizza slices to pineapple people and hot dog characters, incorporating the monstrous to the macabre with ample humor and absurdity. Eastern influences and kitschy references to surf and skate culture often appear in the work, and both artists cite 90’s cartoons like Ren & Stimpy as major graphic influences. With a love of gnarly subversive imagery, from grim reapers to deadly piña coladas, their line work is detailed, complex, and a total trip.